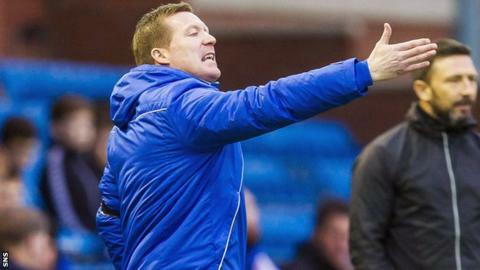 Kilmarnock manager Gary Locke has dismissed the social media rumour mill and expressed his determination to improve his side's form. Responding to claims he had been sacked, Locke told BBC Scotland: "As a manager, you can't really pay too much attention. "The way the world is these days, you could stick something on social media and it spreads like wild fire. "You've just got to get on with your job. That's all you can do." Locke is aware the pressure is building as his team have slipped to second bottom of the Scottish Premiership after seven games without a win. "At any football club, you're going to be under pressure anyway," he said. "I put myself under pressure because recent results haven't been good enough and we need to make sure we get back to winning ways as quickly as possible." Josh Magennis was reportedly critical of his team-mates but Locke dismissed the article as "nonsense"
Kilmarnock have taken only two points from the last 21 available and, following the 4-0 defeat by Aberdeen at the weekend, Josh Magennis was reported to have accused players of not trying, even going as far as saying they should be sacked if that were the case. Locke confirmed he had spoken to the striker about the comments. "To be fair, I've spoken to Josh," he said. "I've heard the interview, the article was nonsense. "Josh was obviously quite hurt by it. At the end of the day, when things aren't going well, these things tend to happen. "It's not as if the players are not trying. They are trying. "It's just when they're lacking in confidence maybe they don't get on the ball as much as they should. "The only way you're going to get through that is by knuckling down and everybody working hard for each other. Then you can turn the corner." Kilmarnock are 10 points worse off than they were at the same stage last season. After 19 league games last year, they had 27 points and were seventh in the table. And Locke added: "Football can quickly change and we've got to make sure that we do that."